If I had to buy a new tablet PC today, it would probably be the HP EliteBook 2740p Tablet PC. 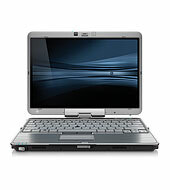 I've used convertible tablet PCs made by Fujitsu, Lenovo, and HP. I like the ThinkPad X200 tablet PC, but the EliteBook 2740p includes features that are more appropriate for a user like me. HP recently refreshed their line of EliteBook 2740p tablet PC. Now, you can spend the same amount of money (1,599.00 and 1,699.00) and you'll get faster machines when you choose either the HP EliteBook 2740p Tablet PC (ENERGY STAR) (XT935UT) or the HP EliteBook 2740p Tablet PC (ENERGY STAR) (XT936UT) pre-configured models on the HP website. You can also configure your model so that you have the latest processing speed by choosing the Intel® Core™ i7-640M Processor (2.80 GHz, 4 MB L3 cache). Like many other convertible tablet PCs, the 2740p includes a multi-touch screen option in addition to the active Wacom digitizer. Since the HP 2740p isn't a rugged tablet PC, if you have the need for a rugged tablet, go with a Panasonic Toughbook instead.